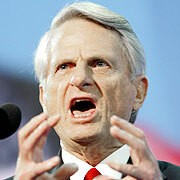 LOS ANGELES (AP) — Retiring U.S. Sen. Zell Miller, the conservative Georgia Democrat who backed President Bush's re-election, is joining Fox News Channel as a contributor. Miller, who made a memorable TV appearance when he challenged MSNBC host Chris Matthews to a duel, will be seen on a variety of Fox News programs starting Jan. 6, a Fox spokesman said Tuesday. "I am excited to be joining Fox News Channel and am eager to contribute to the continuing success of the network," Miller said in a network release. In a raucous interview last fall on "Hardball with Chris Matthews," Miller, 72, angrily told Matthews, "I wish we lived in the day where you could challenge a person to a duel." He made the comment when Matthews pressed him on barbs Miller launched during his convention speech against Democratic presidential contender Sen. John F. Kerry. Miller, a two-term governor of Georgia, was appointed to the Senate in 2000. He's taught history and political science at schools including the University of Georgia. In November, GOP Rep. Johnny Isakson won an election to succeed Miller. 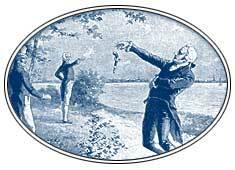 The fatal duel between Alexander Hamilton and Aaron Burr (above) shocked the nation. But it was the identity of the man killed, not the fact of the duel itself, that produced such dismay. By 1804, dueling had become an American fixture. 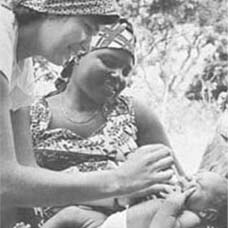 And for another thirty years or more, its popularity would continue to grow. Like many early American customs, dueling was imported. Starting in the Middle Ages, European nobles had defended their honor in man-to-man battles. An early version of dueling was known as "judicial combat," so called because God allegedly judged the man in the right and let him win. In an era known for its bloody encounters, judicial combats probably prevented men from killing in the heat of passion. Still, numerous authorities, including heads of state and the Catholic Church, banned dueling -- with little effect. In 1777, a group of Irishmen codified dueling practices in a document called the Code Duello. The Code contained 26 specific rules outlining all aspects of the duel, from the time of day during which challenges could be received to the number of shots or wounds required for satisfaction of honor. An Americanized version of the Code, written by South Carolina Governor John Lyde Wilson, appeared in 1838. Prior to that, Americans made do with European rules. In a typical duel, each party acted through a second. The seconds' duty, above all, was to try to reconcile the parties without violence. An offended party sent a challenge through his second. If the recipient apologized, the matter usually ended. If he elected to fight, the recipient chose the weapons and the time and place of the encounter. Up until combat began, apologies could be given and the duel stopped. After combat began, it could be stopped at any point after honor had been satisfied. Edward Doty and Edward Lester, of the Massachusetts colony, fought the first recorded American duel in 1621, just a year after the Pilgrims arrived at Plymouth. Armed with swords, both men sustained minor wounds. A unique aspect of this duel was that Doty and Leicester were servants. For the most part, only gentlemen dueled. Most duelists chose guns as their weapons. The large caliber, smoothbore flintlock pistols Hamilton and Burr used in their encounter typified the American dueling weapons. Many American men owned a pair of such pistols, and, from about 1750 to 1850, many were called to use them. The chance of dying in a pistol duel was relatively slim. Flintlocks often misfired. And even in the hands of an experienced shooter, accuracy was difficult. Generally, pistols had to be discharged within three seconds; to take aim for a longer time period was considered dishonorable. In an 1802 duel, DeWitt Clinton was challenged by John Swartwout, a friend of Aaron Burr. Swartwout accused Clinton of trying to ruin Burr with political smears. The men exchanged five rounds. After each round, as the code provided, seconds encouraged the combatants to mend their differences. Clinton adamantly refused to sign a letter of apology. Swartwout, despite being shot in the thigh and ankle, refused to quit. Unwilling to continue shooting at a wounded man, an exasperated Clinton left the field. Surgeons standing at the ready tended Swartwout's wounds. In America, duels were fought by men from all walks of life. But many of America's most important citizens defended their honor on the dueling grounds. Button Gwinnet, who had signed the Declaration of Independence, was shot down by General Lachlan McIntosh in a duel. Commodore Stephen Decatur of the United States Navy, an experienced duelist, died at the hands of another commodore, James Barron. And Abraham Lincoln narrowly averted a battle with swords by apologizing to an Illinois state official he had ridiculed in a local newspaper. Benjamin Franklin and George Washington were among the most prominent Americans to condemn dueling. Franklin called duels a "murderous practice…they decide nothing." And Washington, who undoubtedly needed all the good soldiers he could get, congratulated one of his officers for refusing a challenge, noting that "there are few military decisions that are not offensive to one party or another." Religious and civic officials worked hard to stop duels. But diatribes such as Reverend Mason Weems' illustrated pamphlet "God's Revenge Against Dueling" did little to change public sentiment. Anti-dueling ordinances also failed to stop the flow of blood. Duelists ignored or evaded such laws. In fact, the most popular dueling ground in America was at Bladensburg, Maryland, near the nation's capital. Dueling was banned in Washington, but not in Maryland, which was a short carriage ride away. Irate legislators could simply shuttle out to Bladensburg and fire at will. Due to the partisan nature of their work, politicians frequently received challenges -- as did newspaper editors and attorneys. As a young man, attorney Andrew Jackson, future president of the United States, earned a reputation as a formidable duelist. His honor suffered, however, after a duel against Charles Dickinson in 1806. Dickinson fired his pistol, slightly wounding Jackson. Jackson's weapon misfired -- which according to dueling rules counted as a shot. Technically, the duel should have ended there. But Jackson coldly pulled his hammer back again and fired, this time killing Dickinson. In the eyes of many, Jackson's behavior amounted to little more than murder. By the time of Hamilton and Burr's deadly encounter, dueling had begun to decline -- at least in the North. In the South, where the chivalrous novels of Walter Scott held sway, dueling remained the preferred way to defend one's honor -- or even to commit murder. A jilted lover need only wait for a rival's insult, or even manufacture one. He was then free to challenge and kill the rival without condemnation. Some men -- accurate shots in particular -- practically made careers of the duel. Among these men was Alexander McClung, who once killed an opponent at over 100 feet with a smoothbore pistol. This remarkable shot -- and subsequent killings at shorter distances -- honed McClung's fearful reputation. Yet it was said that he was haunted by the ghosts of his victims, and maybe this was so. The last man McClung killed with a pistol was himself, in 1855. For every man who gloried in the duel, there were many others who feared it. A word or two passed in private company on a Friday night could well mean a challenge on Saturday morning and death on Sunday. Avoiding a challenge wasn't easy. Particularly in the South, where men who refused to duel would be "posted." A statement accusing them of cowardice would be hung in public areas or published in a newspaper or pamphlet. When Congressman John Randolph of Virginia refused to meet General James Wilkinson in a duel, a furious Wilkinson posted him. The post declared "In justice to my character I denounce to the world John Randolph, a member of Congress, as a prevaricating, base, calumniating scoundrel, poltroon, and coward." Wilkinson, a co-conspirator in Aaron Burr's treason plot, had little character to damage. Randolph lost little by his posting. By the time of the Civil War, dueling had begun an irreversible decline, even in the South. Not surprisingly, public opinion, not legislation, caused the change. What once had been a formal process designed to avoid violence and amend grievances had deteriorated into cold-blooded murder. People at last were shocked by it, and they showed their disdain. It may have been too late to save Alexander Hamilton. But if American was to become a truly civilized nation, the publicly sanctioned bloodshed would have to end.